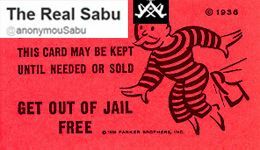 Bump and Update from 5/25/14: As expected, Anonymou Sabu, aka Hector Monsegur, was sentenced to time served today. The judge called his cooperation "extraordinary." See below for the link to his online postings that resulted in his bail being revoked and serving 7 months. After three years, Anonymou Sabu, aka Hector Monsegur, will finally face a federal judge for sentencing on May 27. The infamous former member of Lulzsec and Anonymous, who agreed to cooperate the night of his arrest on June 7, 2011, agreed to plead guilty to 12 felonies in August, 2011, including nine counts related to computer hacking; one count of credit card fraud; one count of conspiring to commit bank fraud, and one count of aggravated identity theft. Charges pending in four other federal districts were dropped as part of his deal. His plea agreement is here. The maximum possible sentence for the 12 counts is 122 years. His sentencing guidelines call for a 259 to 317 months sentence (2 years of which are a mandatory minimum.) His guidelines are based on a total loss amount of $20 million to $50 million (the loss caused by his direct participation was $1.5 to $2 million).